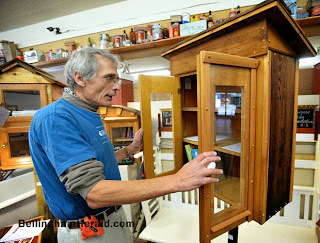 Eberhard Eichner can imagine the fun of browsing for books along curbsides while taking a walk in one of Bellingham's neighborhoods. He's helping bring that dream closer to reality after introducing Bellingham, well known as a town that loves books, to the national organization Little Free Library. His skills fit well with the Wisconsin organization founded three years ago. Eichner, 60, was the first to serve as lead designer and builder for the REvision Division of the RE Store, using salvaged and donated materials to create furniture and other home items. The division won the 2013 Recycler of the Year Reuse Award from the Washington State Recyclers Association. Question: How did you learn about Little Free Library? Answer: It started when a customer came into the RE Store about a year and a half ago. He told me about the program and was looking for materials so he could install a Little Free Library. I researched the program founded in the Midwest and I built the first (local) set of three of them. He bought one from the store. Since then, several have been created and sold in our Bellingham and Seattle stores. A: That's right. I absolutely love the idea. I'm an avid reader myself, with eclectic tastes; research books, poetry, mysteries. A: The libraries currently on display and available for purchase utilize former upper kitchen cabinets. A second "outer skin" with a roof is put around the existing shape using reclaimed cedar boards, shakes, shingles or other scrap exterior siding material. They're like little "houses" for books. Q: How do you protect them from the weather? A: The outsides can be clear-coated with exterior oil, deck stain or paints. The doors of cabinets often can be reused after cutting an opening to allow the user to see the books. A piece of shatterproof acrylic glass is placed over the opening and salvaged weather stripping is placed around the door. Q: What other materials can be used? A: Big drawers, small bookcases and various wooden chests, crates and boxes. You might have the right stuff in your attic, basement or garage. To defray the cost, neighbors can team up to purchase a box. Neighbors can take turns as curators of the box. Q: What else do you advise? A: Since they have to be anchored by a pole, be sure to call utilities before you do any digging. Q: Do you encourage customers to talk with you? A: Yes! I call myself a "repurpose coach." On Saturdays from 11 a.m. to 3 p.m. at the RE Store (2309 Meridian St.) people can come and talk with me, first come, first served. I teach demonstrations of how I can help people repurpose materials. For details about the Little Free Library program, go to littlefreelibrary.org. For more about the REvision Division of the RE Store, go to re-store.org and click on "RE Made Furniture." I'm fond of such creative people. They make our world better. I'll mention about these libraries in my new essay on essayscorer. Other should know how they can use old furniture to make interesting things. They make our world better. I'll mention about these libraries in my new essay.